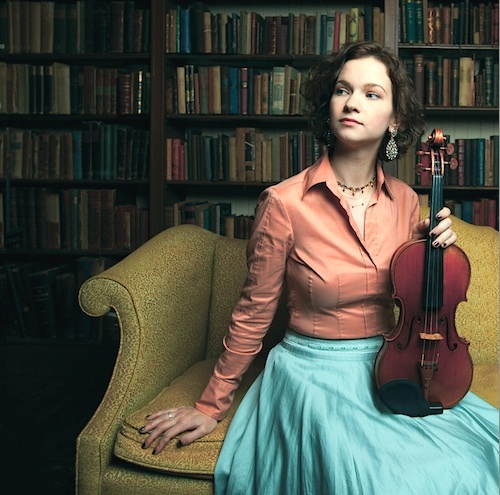 November 11, 2013, 12:22 PM · What started as several dozen cold-calls to composers has now become a major life focus for Hilary Hahn, whose album, In 27 Pieces: The Hilary Hahn Encores, is officially released today. Besides giving life to 27 new, short-length pieces for violin, Hilary's project has done much more: it has provided a sort of tasting menu for both listeners and musicians to sample contemporary classical music by living composers. And how many flavors might we find? A lot! Other than the fact that these works are all under about five minutes and that they are written for violin and piano, each is strikingly unique. I listened and took notes on all 27 pieces, and my observations varied wildly. Here is a sampling: "hypnotic and minimalist; rhythmically driving and complex; a tonal, beautiful melody; sirens and Psycho; busy and fast; fly buzzing; bluegrass language; mournful and throbbing; fast syncopation; Eastern and slide-y; deranged mental patient; melodic, as in a movie score." The 26 composers that Hilary commissioned in 2011 to each write an encore piece for violin are: Antón García Abril, Franghiz Ali-Zadeh, Lera Auerbach, Richard Barrett, Mason Bates, Tina Davidson, David Del Tredici, Avner Dorman, Du Yun, Søren Nils Eichberg, Christos Hatzis, Jennifer Higdon, James Newton Howard, Bun-Ching Lam, David Lang, Paul Moravec, Nico Muhly, Michiru Oshima, Kala Ramnath, Einojuhani Rautavaara, Max Richter, Somei Satoh, Elliott Sharp, Valentin Silvestrov, Mark-Anthony Turnage, and Gillian Whitehead. Jeff Myers was chosen as the 27th composer through an online contest that attracted more than 400 submissions. I spoke to Hilary a week ago about her partnership with pianist Cory Smythe in this project; about what it was like to work with so many composers and learn so much new music in such a short time; and about how other violinists can move forward with contemporary music, using these new miniatures as a possible entryway. We started by talking about the CD release party she held at Greenwich House Music School on Nov. 3. She had many of the composers present for the all-day event, in which there were panel discussions, performances of other works by the composers, a screening of a movie that featured a film score by one composer, and ultimately, a four part-performance, in which which she and pianist Cory Smythe played all 27 encore pieces. Laurie: Tell me all about your release party, it sounded like such a unique event! Hilary: There were a lot of composers, and also a lot of different things happening in various rooms, where I heard pieces by the composers that I hadn't heard before, played live. I played all the encores myself, and pianist Cory Smythe, who is on the record, played with me. We performed all of them for the first time in one day, and we played them in record order. That was interesting because we had toured this program over two seasons, but the record mixes those seasons together. It's not like one disc is one season and the other disc is the other season. So we hadn't played a lot of them in those sequences before. It really gave us an overview, physically, of the project, that we hadn't had before. Laurie: How long did it take to play them all, live? Hilary: I don't know! (She laughs) We did them in four parts. Laurie: How many of your composers were there? Laurie: That's a pretty good turnout. Hilary: They're international, so it was nice that so many were able to make it. Not everyone who is in New York was able to make it, and people came from outside of New York as well. Laurie: I've listened to all of the encores, and I've taken notes on every single one. As I listened, I noticed the important role of the pianist. How did you choose Cory for this project, and what was it like to do this together? It's just such an immense amount of new music. Hilary: Each piece had its own trajectory, and while we worked on them simultaneously (to prepare for touring), it really felt like we were focusing on one at a time. The material doesn't really overlap, and I hadn't played a lot of these composers before. Cory does a lot of new music; he was recommended to me for a concert for which I needed a pianist, and we really hit it off. It just happened that the Encores project was contemporary music, and I was working towards that at the time. So it was as if it was meant to be! He really helped me with understanding how to approach things that you have no idea how to begin with. Not that the pieces were unrecognizable to me, but it was just so much new material, and he works on a lot of new material. While I'd worked (in the past) on one piece at a time, he had experience rehearsing lots of different things at once. So he was able to help me come up with different ways of approaching things when I'd hit a wall. It was really helpful. He's been such a good collaborator; really dedicated, and he's really made this project possible for me in a practical way, performing it day in and day out. He's been such a part of it. Laurie: How did you approach each piece? I mean I'm sure each was different, but over doing 27 of them, did you come up with sort of a process? Do you start it with the violin part alone, or do you read it together first, how did it work? Hilary: I had to start with the violin part alone because I was on the road most of the time. With something that you've never played before, especially a composer you've never played before, you have to familiarize yourself with the patterns and the sequences, sort of the mechanism of how they write for the instrument. So I had to figure out things like bowings and fingerings to start with. Also, I needed to check to see if there was anything that needed to be addressed directly with the composer, before the rehearsal process began. So I would work on it, then I would send some comments to the composer, if I had anything. But mostly, I tried to get it to where I could play it, and then get together with Cory to make sure that it was do-able, that I knew that the piece was in shape in the sense that I wouldn't need to make requests from the composer. Then we could just work on it further. Often we were aiming for a tour, so we had a deadline! (She laughs) We'd work on the deadline. When you're touring, you don't really have as much luxury of time because you have deadlines all the time. Every week you have a performance coming up with repertoire that's pre-set. Not every performance is the repertoire that feels most comfortable at the time. So you never quite know what's going to take more time that particular week, and what's going to take the majority of your time the next week. You just try to work on everything and leave enough room so that if something needs more time, you can give it that time. Laurie: What role did the composer have, in bringing to life these pieces? Did you play these pieces for each composer before you performed them? Were you playing them for composers on Skype, did you wind up doing any changes or revisions together with the composer? Hilary: I tried in some way to work with the composer on each piece, while still letting the composer write what he or she wanted to write. The first part was just the commissioning process, what I requested from the composer: to write something between 1 1/2 and five minutes long, and for it to be for violin and piano. The reason I gave them that time frame was because when you perform something, sometimes you stretch it a little bit, and anything above six or seven minutes is really too long for an encore. I figured, if they wrote for five minutes, it would be fine. And anything under a minute and a half feels too short, but a minute and a half can be a really great length for an encore. Working with the composers themselves -- I spoke with them if I had a question about the violin part, or if I felt like something didn't fit -- or it fit in my hand really well, but it might be tricky in general. For example, I have a really big stretch, so I can stretch to certain things that may not be the best solution for everyone who might play the piece in the future. Of course, there are things that people would do more naturally than I would, but I wouldn't think to mention! (She laughs) But those things that I noticed, I tried to bring up, then the composer could decide whether to write that as an optional feature, rewrite it or just leave it. I don't like to tell a composer what to do, I just like to point out what I can see being an issue for a large group of people. If I'm having trouble playing something and I'm having to come up with a solution that's very unorthodox, I know that other people will have to go through the same process. Sometimes that can be challenging to the listeners, because it sounds like something isn't quite right in that spot. But that's kind of my criteria for mentioning something to the composer. Otherwise, if it's an interpretive issue, I try to take that into my own court and take responsibility for that. As we were rehearsing before the performances, I got to meet and talk with a few of them. If I had a question about how something was written, I did get to meet with these particular composers and ask, 'What do you mean, and how to you want me to play it?' before I got too far into playing it a certain way. But that wasn't everyone. Mostly, we prepared for the performances and then started performing the pieces. We got a feel for what we felt the pieces could be, and then sent off rehearsal recordings to the composers -- very unprofessional recordings! -- but good enough that they could tell if we were doing a wrong note. I wanted to make sure that the composers could catch that, and also they could give input on the interpretation. I was in touch with all of them about that, except for one person who was just pretty much impossible to reach via technology. If I hadn't managed to reach them before the tours, I made sure to reach them before we recorded, so that going into the sessions, we knew what to do. We wanted to be sure that the composers would be happy, as much as possible. Laurie: I noticed that you have interviews up on your YouTube channel with 17 of the composers. They provide an interesting perspective. Did you do those interviews after you'd already been playing each composer's piece for a while? Hilary: I interviewed some of the composers before I received their pieces; and I talked some to along the way, while I was working on their piece. We'd be in touch about something, and I'd say, 'Oh, can you hop on Skype for a little bit, and I can record an interview?' Some of them, I still want to interview. It's tricky when you have a lot of different schedules, different time zones and unreliable Internet connections. If it's a bad Internet connection, it's a bad interview! (She laughs) -- at least for the people trying to watch it. If I don't know how good my Internet connection is going to be, it's hard to organize something in advance, if say, I'm going to be somewhere for two days. It's actually more complicated than it seems! Hilary: It's fun, I alway enjoy the interviews. I like talking with people when they have a different context to express themselves in. You have your normal collaborative conversations, and you have your chilling-out-after-collaborating kinds of conversations. But then when people are speaking to a different audience, and they don't know who exactly is listening, they explain themselves in a different way. You learn different things about them. That's one reason I really like interviewing people; it helps me understand where they're coming from. Laurie: One thing I thought was really neat about this project, is that it's almost like a little lens through which you can get to know 27 contemporary composers. I wondered what your perspective was, having really lived with all these pieces. For you, is there any conclusion you can make about the state of music composition here and now, based on this big project you've just done? Hilary: It's hard to generalize. I never wanted it to be a collection of names -- it's more of an exhibit, it's more of a showcase of each one, but there are multiple ones. One thing that I really saw illustrated very clearly in the course of this project is how each composer is so individual. They all have their own reasons for creating, they all have their own ways of creating, and they have different interests outside of music that are also related to the arts that feed back into how they write. Since I'd worked with a limited number of composers before, I thought that after a while you would start to see some patterns, or types. But I found that there are actually no types. I haven't found any mirroring between any of the composers and how they write and how they create. That's been illuminating for me, and I think that however far you would go in composition, you would find that to be the case. Hilary: …the bassists who have so many different hobbies -- it seems like I know a lot of bassists who repair cars or bake bread! It's not like every one of the instrumentalists in those groups does stuff like that, but you do see a few patterns. But I found, with the composers, there were none of those. Working on this project, I wanted each piece to have its own character, and I wanted to make sure that no piece would get lost in the group. Getting a feel for the different personalities of the composers helped me to understand how to differentiate the pieces. But in the end, it was the pieces that really determined that. Laurie: Was there anything in the pieces that surprised you, or required new techniques or funny ways of using the violin? Hilary: Each piece taught me something, and it was amazing what difference there was for me, between a piece by a composer I'd played before and a piece by a composer I'd never played. When I received Jennifer (Higdon)'s piece and when I received James Newton Howard's piece, it was like recognizing a language. I just knew what to do with it, immediately. With all the others, I had to find my way into the piece, using the composer's musical language in the context of the piece, to start with, and then seeing how the piece develops on tour. What I thought each piece was, is not necessarily what it turned out to be. When you're working on something, you first need to take what's presented to you in the score, and then you need to figure out what really makes it innate for you, in order to be able to bring it across to the audience. I was trying to figure out that innate element in every single one -- but with brand-new people, brand-new ways of expressing their thoughts, and perhaps brand-new thoughts, too. So there were definitely things that pushed me in each piece. Sometimes it's hard to specify exactly what. It has very little to do with what you actually see in the music itself, and a lot more to do with how you get to the point where you feel like it's part of you. But there were definitely some techniques that I'd never done before, and it really helped to work on those pieces, to have the performances and to get to where those techniques became familiar to me. They became more ways of expression that I could tap into. Laurie: Like what kind of techniques? Hilary: Well, if you look at the score for Richard Barrett's piece ("Shade") or for Elliott Sharp's piece ("Storm of the Eye"), I had to learn how to do a whole bunch of things. In "Storm of the Eye," I had to learn how to relate to the instrument the way Elliott relates to the instrument, because he's a performer, so he improvises, he plays multiple instruments. (At the release event), he was performing one of his guitar works, and you could really see the thread of continuity between what he was playing himself, and what he'd written for me to play. But I had to learn how to get there in his piece, and I also found it helpful to talk with him about what he was aiming for with the different effects that he wrote. I realized, he's kind of self-taught, and he's looking for these sounds; then in the course of finding them, he figures out how to write them. I'm not big into researching everything about a composer before you learn a piece for the first time, because I think it can give you a very particular idea of what you should be doing with a piece before the piece actually speaks to you. That's why, in these cases, I wanted to start with the piece. But then when I met with the composers, asked them questions, and they gave me feedback about what I was doing, that's when I realized what they were going for and what I needed to do in order to align with what they had in mind. So it was a multi-step process. Technically, I'd say Richard Barrett's piece or Elliott Sharp's piece had the most unfamiliar techniques in them. But also, in Du Yun's writing ("When a Tiger Meets a Rosa Rugosa"), I had to figure out what she meant by some of her markings. And when I worked on Antón García Abril's piece ("Third Sigh"), I entirely got the wrong idea from some of his markings. So I'm glad I had a meeting with him because once he explained to me what he meant, it made perfect sense. But it's hard to guess things. It also makes you wonder how much you've been guessing wrong about other pieces, where you can't talk to the composer! Everyone thinks they know what they're doing, but is that really what the composer meant by that word? You don't know! Laurie: It could be that 50 recordings of the Tchaikovsky just all have it wrong! Hilary: Exactly! And even if the source says something, maybe we don't know what they meant by that expression. We think we know. But it's unbelievable how much variety there can be in the same words. So that was interesting. Then in something like Avner Dorman's piece ("Memory Games"), there's a lot of rhythmic novelty, and it was complicated to put together. Laurie: That's what I wrote when I heard it, "rhythmically complex"! Hilary: And it's so fast! So it took a lot of time to put together. And then there's a piece called "Levitation" by Søren Nils Eichberg, and I had to figure out, with those particular forms of phrase he writes, how to relate to that in the longer violin line. Also, it handles differently on violin than it does on piano, but we play overlapping things. So I had to figure out with Cory, what our goals were with those phrases. Laurie: Listening to that one, I wondered if Eichberg was a pianist, because there was so much in the piano with that piece. Hilary: Which is nice, I was hoping that people would write things which were substantial for piano. People were all over the place with how they wanted to handle the duo capabilities. By 'all over the place,' I don't mean in a messy way, I mean in an interesting way. David Lang, for example, wrote this piece ("light moving") that has the violin pretty much accompanying, and the piano takes the lead on the phrasing. I really liked that aspect of that piece, and that's something new that I got to do. Every piece has something, a certain approach, that I had to learn. Laurie: Did it change you as a musician, to learn all these new pieces? Hilary: I think every piece does, doesn't it? When you work on something that's new, but also when you work on something after working on something else, it changes your context for that piece. I don't know if it changes you as much as it informs you and develops you, just to have that (new) context to draw from. Every time that you have a different exposure to music, you have one more thing you can refer to in your experience. And you have more options, also, with musical ideas, when you're exposed to other people's musical ideas, whether that's through working with a conductor, or working with someone who's improvising, or working with someone who wants you to do a certain thing with the instrument. You just get all these different options in your mind. Laurie: You have a LOT of options here! Laurie: Will the sheet music be available, if people want to play these? Hilary: There's going to be a complete printed edition, and most will be available digitally, as well. Hilary: This project is so huge! We're wrapping up the fingerings, bowings and proofreading part of the publishing. It's coming soon! Very soon. Laurie: What if I were to want to play one of these pieces? That would be, someone who is not a superstar soloist, just kind of your average trained violinist. Which of them is maybe the most idiomatic, or, I hesitate to say 'easy,' but playable to someone who is just approaching these pieces? Hilary: I'm going to be kind of annoying with this answer because it's not going to really answer your question! I think that with anything new, you have to want to play it. I don't think it's a matter so much of being able to play it, as it is being interested in it. So I would suggest that people listen to these pieces, and if they really like a certain piece, then check out the music. Even if it's something that they don't know how to play, or something they think sounds really hard -- just to work at something at quarter tempo is really interesting, just to learn how something is put together. I don't play piano very well, but sometimes I'll sit down with something really simple, or even something hard, if I'm trying to figure out a phrase in a sonata. I'll just play it super slowly. But it helps me understand what's in the piece. My goal, for players, is to show a lot of different composers' work and to have a range of things that would interest people. I hope that people will find things they like, and even if they don't wind up playing a particular piece, they'll explore that composer further. Every one of these composers has a range of pieces that they've written, a range of technically challenging things. I think you can probably find something from a composer that you really like, that you can play, no matter what level you're at, even if it's a slow movement, or if it's played at a moderate tempo. So I'm not going to suggest a particular piece; I would suggest that people listen and find something that interests or intrigues them. If you are curious or intrigued by something, there's no better way to figure out what it is that intrigues you about it, than to look at it in the applied way: try to play it. Laurie: One of the pieces I was immediately curious about was the one by Jennifer Higdon ("Echo Dash"); it's so fast and syncopated. I thought, is she just following the pianist, a half-beat behind? Holy cow! Hilary: We're playing 8ths and 16ths, but they're syncopated. And we have staggered 8th notes -- we never have staggered 16ths. We have the 16ths together, and we have triplet 16ths. So it could be played at a slower tempo and be fun. You could definitely play the violin part at a slower tempo, even if you're not super virtuosic, you could probably do it. But the most difficult thing about that piece is keeping track of the rhythm. Hilary: Even something like the Lang -- it's very hard to play, but it's the same thing: it repeats an octave higher in the second half, so you could even treat that as a very slow warm up. Not like an etude, but think about it musically. But you can get it in your fingers. Even if you don't want to play the high one, you can play the low one. There are ways to work on these pieces, even if they're extremely challenging, so that you learn contemporary music and incorporate it into your daily life, without it being a big deal. Everyone works on pieces that are hard, and it doesn't have to be a piece that you've heard for decades, it can be a newer piece, too. I think sometimes people think of new music as a whole separate category -- but it's really not. It's just part of the continuum, and I think we need to treat it as part of the continuum and include things from all different centuries in our daily musical work or exploration. Hilary: Exactly, that was a big hope for me. And also, if you think about it, none of these pieces is extremely long. I think the longest violin part is 10 pages, and the shortest is one page. So you can learn them and work on them over time, and play a whole piece that's contemporary. And with piano, you can have a way to work on it without needing to put together an orchestra or program something for a half an hour. You can chip away at things, work on it with a pianist you know, and get to know it, without it taking up your entire year. Laurie: I'm looking forward to the book of sheet music coming out for these. Hilary: It's kind of a trip through possibilities of violin interpretation -- interpreting the technique, as well as the ways you can make music with the instrument. Laurie: I saw your interview with Jennifer Higdon, where she said, 'I figured people would write slow pieces.' It was interesting she said that, because people wrote pieces all over the map. They aren't all slow pieces, they aren't all fast pieces, there's just everything here, it's crazy. Hilary: People wrote pieces that were slow pieces, that were fast pieces, that were in between, that were very slow but went fast, that started slow went fast went slow, that started fast went slow went fast, (she laughs) all kinds of combinations! And about half of them were thinking, 'What is everyone else going to write? How can I stand out in a way that's different?' And I don't think they could have known what everyone else was going to write, but I think it's an interesting question. Laurie: An interesting sociological experiment. Hilary: But you know, they've all been so supportive of the project and of the idea that there are people gathered together, composing for it. I wasn't sure whether the fact that there are multiple composers involved would be frustrating for some of them, but no one had any issue. Everyone was just glad to have everyone else participating. It's been really nice to see that support in the composer community. Below is a great little video about this project. Personally, my favorite part is when pianist Cory Smythe says, "I got off the train one day and saw I had a voice mail from an unknown number. Those are always the most exciting messages, in a way, because you always hope it's going to be, like, Hilary Hahn. And it never is. But in this instance…"
November 12, 2013 at 07:21 AM · Thank you for the fantastic interview!!! It was thought provoking - I loved what Hilary said about learning new pieces. It is always a treat to hear anything Hilary Hahn plays and I can't wait to listen to the encores! November 12, 2013 at 09:43 PM · It's true, that more than anything, motivation determines whether or not you will learn something, and learn it well! November 15, 2013 at 08:13 PM · Oh, always a pleasure to read an interview between you and Hilary. She is such an interesting, giving musician, not to mention wondrously talented and a pleasure to listen to. Please come back to perform in San Francisco again, soon, Hilary! November 18, 2013 at 09:17 AM · Thank you so much for this and Hilary Hahn is just amazing! Not just with her virtuosity on the violin but this project is another testament to her gift of music. Her insights are really amazing to read. It speaks volume on her artistry, no, scratch that, her genius. I bit the bullet and ordered the CD via Amazon. Excited to see it in my mailbox here in Singapore.